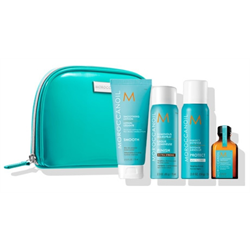 Ensure you always have what you need to achieve the style you love with the Moroccanoil Destination: Style Travel Set. This limited edition set comes in a cosmetic bag, making it easy to transport your products wherever life takes you. It includes travel-size versions of some of Moroccanoil's argan oil-infused styling products, including Perfect Defense to protect against heat damage, Smoothing Lotion to hydrate and tame frizz and Luminous Hairspray Extra Strong to lock in your look. Moroccanoil Treatment: The original foundation for hairstyling that can be used as a conditioning, styling and finishing tool. Rich in argan oil and reparative proteins. Smoothing Lotion: All-in-one blow-dry hair lotion infused with expertly blended technologies that leave hair smooth and manageable. Perfect Defense: This nourishing formula re-hydrates the hair while protecting against the damaging effects of heat styling up to 450°F/230°C. Luminous Hairspray Extra Strong: Provides a long-lasting hold without sacrificing nourishment. Ideal for setting demanding updos and hairstyles, including special-event looks.